A skilful, high-stepping Scotland international signed by Bill Shankly as the last piece of his double trophy-winning jigsaw in 1972-73. The elegant former Hibernian midfielder cost 110,000 pounds from Nottingham Forest after being recommended by Shankly's brother Bob. Cormack, menacing in the air and packing a powerful shot, made a telling contribution to Liverpool's capture of the League Championship and UEFA Cup in his first season at Anfield. He scored eight goals in 30 outings to help secure Liverpool's first championship for seven years while he figured in 10 of the club's 12 games in a thrilling UEFA campaign which landed d Anfield's first European trophy after a two-leg conquest of Borussia Moenchengladbach in the final. The following year Cormack collected a FA Cup winners medal after the Wembley defeat of Newcastle and earned a second title medal and another in the UEFA Cup under Bob Paisley's management in 1976. In November that year he joined Bristol City for 50,000 pounds, later managing Partick and in Cyprus and Botswana, before becoming an after dinner speaker based in his native Edinburgh. The statistics of matches and goals at the top is included in the table by the conducted player of a reserve in a seasons 1972-73, 1974-75, 1975-76 not completely. 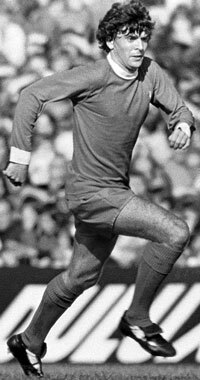 Bill Shankly bought Peter Cormack as a utility player and the Edinburgh-born star, who joined the Reds for 110,000 pounds in July 1972, proved to be just that. Brilliant in the air, and gutsy, Cormack began as a midfield attacker and developed into a constructive player whose distribution was immaculate. He came to Liverpool from Nottingham Forest and before that made 182 appearances (75 goals) for Hibernian. He was recommended to Liverpool by Bill Shankly's brother, Bob. In his first season with the Reds, Cormack won Championship and UEFA Cup medals. In 1973-4, he won an FA Cup winners' medal, then featured in the first team for one more full season before giving way to Ray Kennedy. Cormack won nine Scottish caps whilst with Hibs and Forest. Strangely, he did not win another during his time at Anfield, although he was playing as well as ever. In November 1976, he moved to Bristol City, for 50,000 pounds. He returned to Hibs briefly in 1980 before becoming Partick Thistle manager. He went on to manage Anartosi in Cyprus and became Botswana's national coach in 1986.